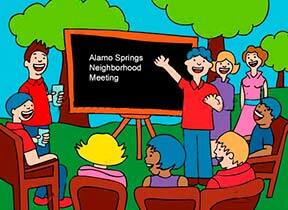 YOU are invited to the first “Alamo Springs Neighbor to Neighbor” gathering. Mark your calendar! It’s Saturday, February 21st at 7:00pm at the Alamo Springs Christian Fellowship at 506 Alamo Rd.. This is a Community event – this is not a Church sponsored event. It is the first of what we hope are many to come. It is neighbors coming together to enjoy each other, share and strengthen the bonds of our community with creativity and fun. This first meeting is very important so we can get YOUR input on events, neighborhood concerns, possible talents you would like to express or event/meetings you would like. In the coming weeks, we will be compiling an “Alamo Springs Neighbor to Neighbor” Directory, for those of you who would like to be included. We will have it printed and given to all residents so that we can have names and phone numbers of your friends and neighbors. This directory will also offer a mini “Yellow Pages” with services of folks in and near Alamo Springs who may have something to offer you. It will also have a couple of pages of the History of Alamo Springs for fun facts and to remind us how far we have come in this journey together. This is NOT an attempt to form any sort of Homeowners or Landowners association – this is just Neighbors getting to know Neighbors and being here for each other. We would like to have at least a monthly gathering where we can play Dominos, Checkers, have folks speak on topics they would like to share, such as gardening, cast iron cooking, hydroponics, fire safety, and anything else someone wants to share or learn. We are a diverse community but, share a common bond of being neighbors and the love of this special place Alamo Springs, so let’s get together and strengthen each other in love and community. Please call and RSVP so we’ll know how many treats to bring. Please bring your own beverage (non-alcohol of course). Hope to see you there! ***Check it out an online community for Alamo Springs has been set up – Visit it and join!